Yesterday, we hosted a group of homeschool friends at our home. The aim was to learn a little bit about electricity because alongside things like (1) the lost continent of Atlantis and (2) the connection between the Mayan and Aztec civilizations and beings from another planet, my oldest son placed learning about electricity on his long list of subjects to study this year. I am pretty happy with homeschooling for our family and haven’t had too many bumps along the eleven year road we’ve been on. It is a great fit for our family. However, this straight A student received one C in high school–which I still shudder to think about–and that was in chemistry. Now I realize electricity doesn’t fall strictly into the scientific category of chemistry, but beyond the earth sciences, my mind tends to go blank when we start to talk science. So, I have always been a little worried about helping my kids “learn” in this one area. And that was how I felt about electricity at first. It honestly didn’t make that much sense to me. I knew it was here, in my house, powering many, many things. But what was it, exactly? It seemed so vague and mysterious. How do things like the sun and wind and burning coal and fossil fuels become the energy that turns on my light. It baffled me, a bit. But for the project, I got down to the basics and figured it out in a way that made sense to me, and now you can ask me anything (or maybe just a little) about atoms and electrons and harnessing them, and unstable metals and currents, and I might be able to help you (just a little). Oh, the beauty of teaching my children! But the best part of the day, and the part that really struck me and brought this homeschool activity to this page in the first place, was the experiment. I thought about looking for a book of electricity experiments for kids from the library to find something to do as an activity, but decided instead that I could probably find something on the Internet. 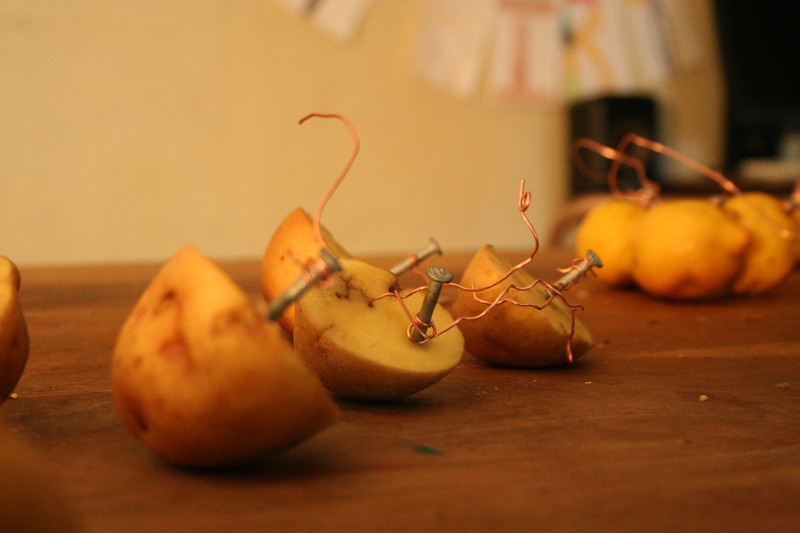 And I did–all over e-how, multiple explanations of how to light up a little LED bulb using lemons and potatoes. Fun! The only thing was, as we tried to do this ourselves before having all the kids over, we found that we could not get it to work. I was cursing the over simplified banality of these stock tutorials on the Internet. Not helpful! But we forged ahead with our plan, and after a little talk about the what’s of electricity, as a group we all tried again to get the experiment to work. It wasn’t happening at first. To be honest, I hadn’t expected it to. But one father had thought to test the amps with some contraption from our shop and we found out that although the bulbs weren’t lighting up, there was some electricity being produced. Then one clever little boy suggested we should just try using a bunch of lemons to light it up, and hooray, that worked! 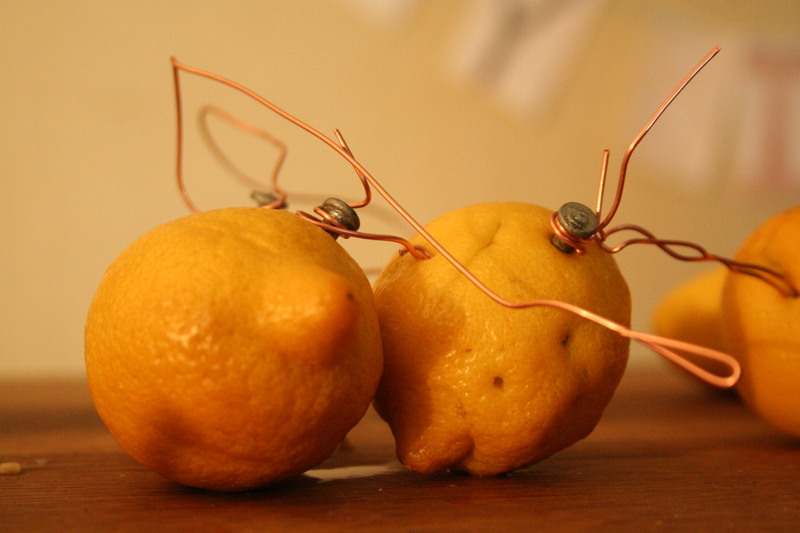 Five lemons making a loop of circuit lit the bulb; we then found we could take away one and two and so on and we saw the light dim each time. It was the same with the potatoes, we just needed more. I’m really not sure why this wasn’t mentioned on any of those tutorials, but let this stand as more detailed information for anyone else trying this at home. As frustrated as I was along the way in preparing for this activity, I realized afterwards that it worked out so perfectly. That it didn’t work at first and that the problem was solved while we were doing it was just right. We didn’t exactly make lemonade yesterday, but we did make light, out of lemons. More than really learning the specifics of electricity, especially for the younger set, I think the kids learned a good life lesson and the basic formula for scientific study, a win-win. For me, aside from gaining a grasp–in the simplest sense,–of what exactly electricity is and how it is that it is all around us (and finally seeing how it could be that Mr. Tesla was going to harness it from the sky), and besides really having a concrete visual of how much “energy” it takes to light one, tiny energy efficient LED Christmas light bulb and translating that to the massive amount of energy we use (woah! )–besides all that, I was left thinking about some of the other ways we are trying to make light out of the inevitable lemons of our farming year. All through the season, as we deal with the weather or the pests, the crop failures and successes, we continually revise the system for the next farming year in our minds. We go through a number of new ideas in theory, sometimes with plans that are wildly different from each other and/or wildly different from what we are currently doing. The dust usually settles though, and in the fall, when the harvest is so abundant and everything on the farm is kind of static for a moment, we have to finalize our plans for next year for real and in this moment, we don’t always believe the same story we lived through earlier in the season. I suppose that is for the best, farming–and gardening, too–are perennially an act of hope and faith, a positive stand to make, no matter the realities they also entail. But this year, even though right now we are looking forward to another great season and feel like we have a good plan, we also aren’t forgetting some of the aha! light bulb lighting moments we had. Life is nothing if not for learning, and sometimes it is for simply remembering and being ready. We both realized/remembered that farming wasn’t the only thing we had to offer the world, and that maybe our farm was just perfect the way it was, not growing past our own land and not growing in terms of monetary income. Maybe, putting all of our eggs in this one basket wasn’t the way for our family, especially when the basket is farming and we are, literally, always going to have to contend with the elements. This was an exciting revelation. I need to write more about all of that later and get out the details of our next farming season soon; but to be clear, our farm as it is will continue offering our own small-ish contribution to the local food scene through CSA offerings and market offerings. And really, this is only small by a matter of degrees, since there are both smaller operations and bigger operations in the hood. Really, it is not small at all. We are just letting go of the need to get bigger. We are just going to shine our light in other areas of the market place now, as well. The farmer with his woodworking. Me, maybe with my words. Exciting! The lemons, this year, shined new light into our life paths. We are grateful for the lesson. It’s great that you’re homeschooling. I was homeschooled myself and we did stuff like this all the time. It was awesome! Kudos to you! If I may, though, I’d like to suggest that you make sure your kids study structured math every year and ged thier GED at 16-17. Not having these two things have been a big burden on me… Although I don’t regret that I was homeschooled, consistant math and a degre equivillent have made it hard to get a further education.